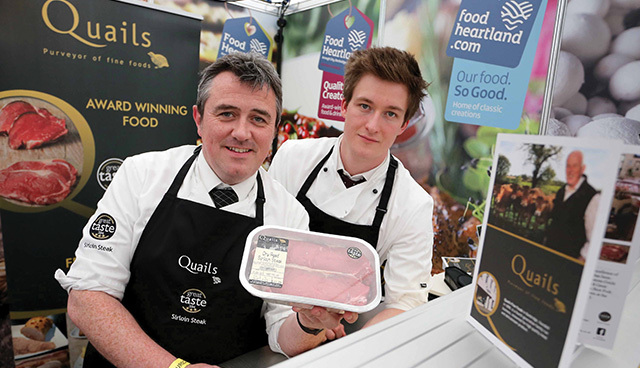 Quails Fine Foods, Banbridge picked up seven Great Taste stars following months of judging in the world’s most coveted blind-tasted food competition. 2017 was a bumper year for Armagh City, Banbridge and Craigavon Borough, with 23 food and drink producers scooping 44 prestigious Great Taste and Irish Food Awards. This is a testament to the borough’s reputation for quality and excellence, and ultimately why the region is known as the Food Heartland of Northern Ireland. The borough has firmly cemented its reputation as the Food Heartland of Northern Ireland, being characterised by a rich environment of good agricultural land, making it the natural home to an abundance of specialist artisan food and drink producers. Award-winning food and drink producers from Armagh City, Banbridge and Craigavon Borough gathered at Craigavon Civic and Conference Centre, as Lord Mayor, Alderman Gareth Wilson hosted a celebratory lunch in recognition of their recent success and outstanding produce. Also pictured, Councillor Colin McCusker, Vice-Chair of Economic Development and Regeneration Committee and Olga Murtagh, Strategic Director – Place. Building on this strong base within the agri-food sector is a significant priority for the council and by working alongside local food and drink companies, they created the Food Heartland Forum and Food Heartland brand. This multi-faceted initiative has flourished in the past two years, with scores of local agri-food businesses receiving recognition for their quality products and services. The borough performed extremely well at the 2017 Great Taste Awards – the world’s most coveted blind-tasted food competition viewed as the Oscars of the food industry. Following months of judging, 37 Great Taste stars were awarded to 31 products from 16 producers in the borough. Quails Fine Foods, Banbridge and The Yellow Door Deli, Portadown were awarded an incredible seven stars each. Burren Balsamics and White’s Oats also impressed the judges, scooping five and four stars respectively. 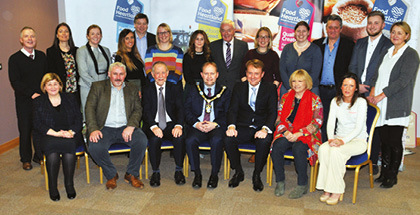 Award-winning food and drink producers from Armagh City, Banbridge and Craigavon Borough gathered at Craigavon Civic and Conference Centre, as Lord Mayor, Alderman Gareth Wilson hosted a celebratory lunch in recognition of their recent success and outstanding produce. Representing the varied aspects of the agri-food sector, all award winners embody the genuine love and passion for what they do and where they are from, which is a common thread woven throughout all Food Heartland food and drink producers. The agri-food sector continues to be a significant priority for Armagh City, Banbridge and Craigavon Borough Council, and this was recognised in 2017 when the council scooped five industry awards for various Food Heartland initiatives. The Food Heartland Forum, which was developed in partnership with local producers and key industry ambassadors to promote, support and cultivate the thriving sector in the area, picked up the Best Food Story, Roots to Market and Highly Commended Destination Delicious at the Northern Ireland Food and Drinks Awards, and won the Best Enterprise Initiative by a Council at the Northern Ireland Local Government Association (NILGA) Awards. The Food Heartland’s ‘Inspirational Career Days’ also secured the accolade of Best Local Authority Community Planning Initiative at the recent NILGA Awards, recognising how it was addressing the skills shortage facing the agri-food, hospitality and tourism sectors. The career days were held in 2017 with over 330 students from 14 schools taking part. The events provided the perfect setting for students to meet industry experts working in varied roles within the Food Heartland, giving young people an insight into the range of potential career pathways and qualification options. As a legacy to the 2016 Year of Food & Drink, ABC Council committed funding to host Food Heartland Awards on a biennial basis moving forward, with the next awards due to take place in 2018. Building on the success of 2016, these awards will celebrate and champion the best local produce and the local people behind this thriving sector. The Food Heartland Awards 2018 will be pivotal in celebrating local people and local produce. It will help raise the profile of the agri-food and drink sector in the borough to a local audience and beyond. As was the case in the successful 2016 awards, this event will be exciting, innovative and inspirational. It is envisaged that around 250 of the borough’s food and drink producers, as well as key individuals involved with supporting and developing the sector from across Northern Ireland and further afield, will enter the awards. Among Armagh City, Banbridge and Craigavon Borough Council’s award wins in 2017 were five industry awards for various Food Heartland initiatives. 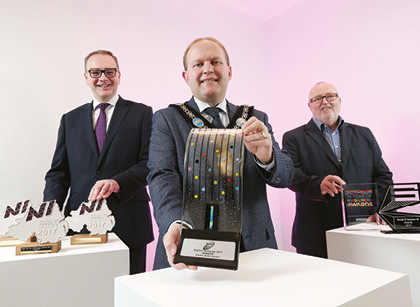 Pictured above: Roger Wilson, Chief Executive ABC Council; Lord Mayor Alderman Gareth Wilson; and Councillor Joe Nelson, Chair of Economic Development and Regeneration Committee. In continuing to support the agri-food industry, Armagh City, Banbridge and Craigavon Borough Council sponsored and hosted agendaNi’s Northern Ireland Agri-Business Conference ‘Looking Beyond 2022’. Guest speakers at the February 2018 conference in Craigavon Civic and Conference Centre covered a range of issues from Northern Irish agriculture post-Brexit, the future economic direction of UK agriculture and food and farming growth in Northern Ireland. Delegates took the opportunity to network with colleagues in the food and drink industry, view exhibitions, and question the expert panel. For more information please contact the Economic Development team at Armagh City, Banbridge and Craigavon Borough Council. Irish agriculture: is the glass half empty or half full? eolas provides in-depth coverage of key issues and regular features including: public sector reform, health, education, environment, energy, business & economy, north-south, voluntary & community, public affairs, media profile and people. © Copyright eolas Magazine 2019. All rights reserved.